ColecoVision.dk presents: Anti Environment (Encounter) © 1984 by: Programmers 3 Inc. 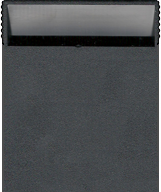 Initially © and Licenses: Brøderbund, Apple II, Coleco Inc. Original SFX Programmer: Programmers 3 Inc.
ColecoVision GFX Programmed by: Programmers 3 Inc.
ColecoVision SFX Programmed by: Programmers 3 Inc. A.E. 's- deadly flying rays from an alien world. They hunt in swift "killing packs" and their sting is deadly. You've got to blast them with your twin-barreled Stun Gun before they zap you. - Or you might not live to tell the tale. ! 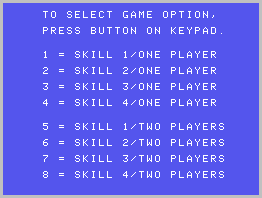 To enter Screensaver mode: press: "0"
For activate a new game again, press: "reset". High Score For The ColecoVision Version Of: A. E. Encounter, Skill level: 1. High Score For The ColecoVision Version Of: A. E. Encounter, Skill Level: 2. 1st XScore: 1st XScore: 1st XScore: 16.300 - November 29, 2014. 2nd XScore: 2nd XScore: 2nd XScore: 11.100 - November 29, 2014. High Score For The ColecoVision Version Of: A. E. Encounter, Skill Level: 3. 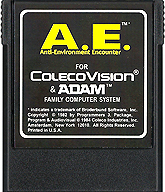 High Score For The ColecoVision Version Of: A. E. Encounter, Skill Level: 4. ColecoVision.dk Game # 92, Anti-Environment (Encounter) is last updated: March 23, 2019.